Figure 83.5 Mass-balance sensitivity for whole glaciers compared with mass balance sensitivity at the arithmetic mean elevation of the glacier. Both sensitivities calculated with the degree-day model of Braithwaite et al. (2003). single characteristic altitude on the glacier rather than over the full altitude range. 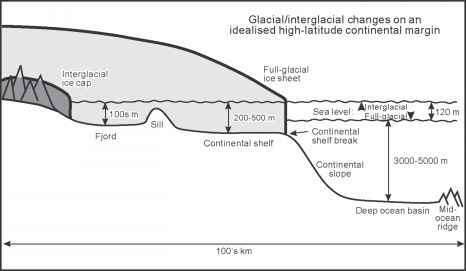 This is an important result because the degree-day model can now be applied to the estimated glacier equilibrium line altitude (ELA) over whole glacier regions. The mass balance at the ELA must be zero so the model can be tuned to give zero mass balance at this altitude and the degree-day model (and probably a simple energy-balance model) can be applied to thousands of glaciers where ELAs are roughly estimated from aerial photographs and topographic maps.